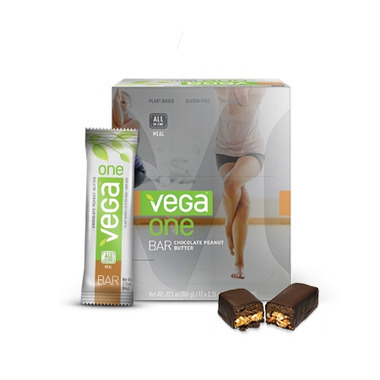 Vega One Meal Bar is gluten-free and contains no artificial flavours, colours or sweeteners. Delicious. Very satisfying and full of good things for you. These bars taste great and keep you feeling full for awhile. I have been a fan of the shake mix for over a year and the bars make me feel the same way. Great taste ! 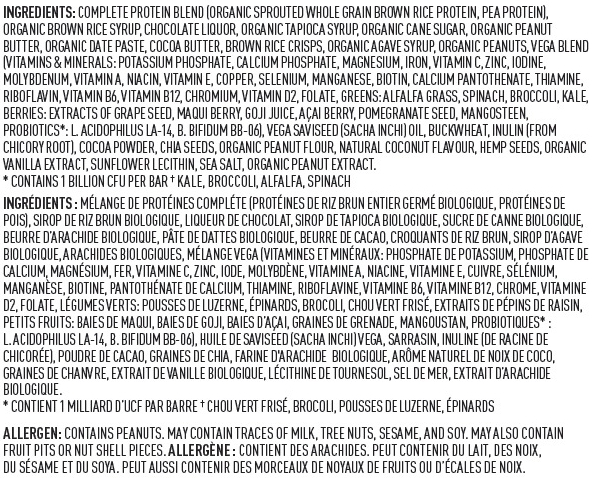 Packed full of 25 vitamins protein 13g.Very filling. Good choice to have before going to exercise and can't get home for a meal. delicious. Tastes like a candy bar. These have a very unique flavor, but once you have a few bites of one of these bars, it really does grow on you. I feel very satisfied after eating one. These are more substantial than most meal replacement bars on the market. They are vegan, they are non-GMO, gluten and dairy free...can't ask for much more! So delicious! Packed with nutrition. My go to protien bar when I need a snack of just after a work out. These things are delicious!!! My go-to 'chocolate bar' and they're VEGAN!!! These are great and filling. I carry them to work for lunches or when I work an odd timed shifted they are filling. Tastes great & surprisingly filling for a bar.